This is a situation where an owner of the company invests money into the firm. The owner does so in hopes of making a return on their investment, but does not have a specific timetable in mind for repayment of the loan. If you don’t already have a Contributions from Owner account, follow these steps described previously for creating a new account, but choose Equity and name the account Contributions from Owner. From time to time the owner may need to make a loan to the company. If the owner expects this money to be repaid, establish a Loan account on the chart of accounts and record the deposit of the loan to this new account. Although this may seem Orwellian, you may find that you sometimes need to carry out forensic research on a particular QuickBooks transaction. In layman’s terms, this means looking into who changed or deleted a transaction, determining what date the transaction changed, and how the transaction looked before it changed. In this article we’ll discuss five different audit reports that QuickBooks provides, as well as show you some easier ways to mine the data within these reports. 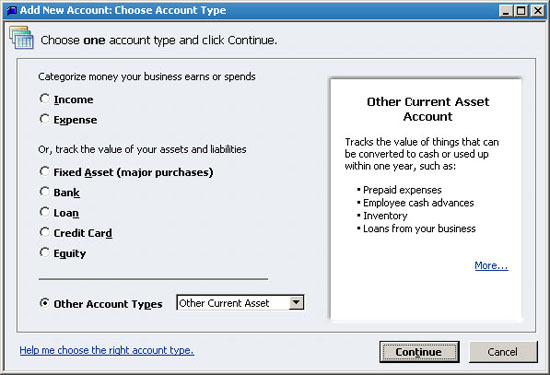 Expert tip: It’s best to assign a separate user ID to each QuickBooks user. To do so, choose Company, Set up Users and Passwords, and then follow the onscreen prompts. Once you set it up, you’ll be able to have accountability for every transaction entered or modified in QuickBooks. As previously discussed, the Audit Trail is automatically enabled in QuickBooks, and it cannot be disabled. 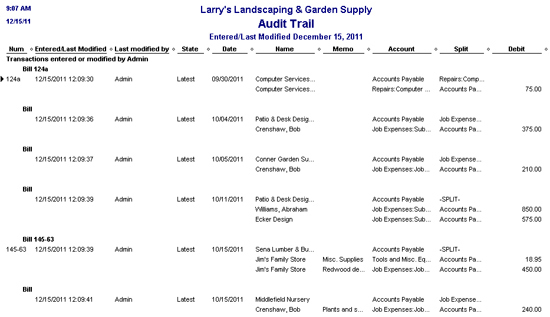 To view the audit trail, choose Reports, Accountant & Taxes, and then Audit Trail. 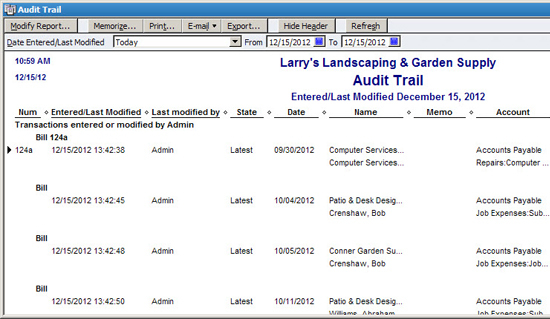 As shown in Figure 1, the audit trail report will appear onscreen. Figure 1: By default, the Audit Trail shows all activity for today. 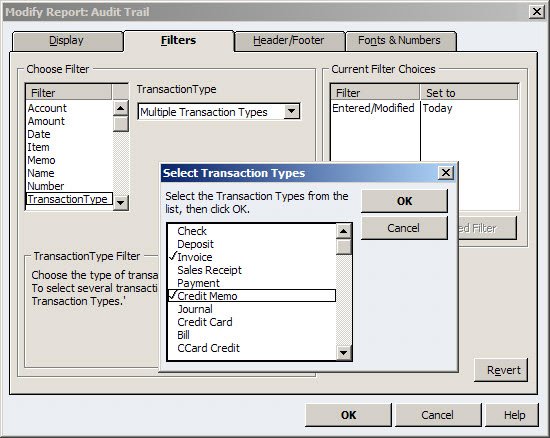 Choose Transaction Type from the Filter List, and then choose Multiple Transaction Types from the Transaction Type list. As shown in Figure 2, you can then select one or more transaction types to display. Click OK twice to display the report. 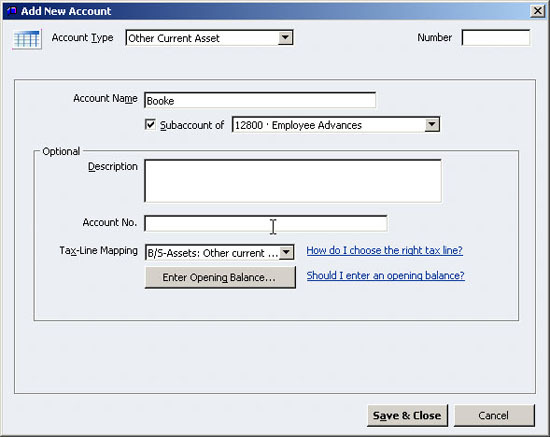 Figure 2: You can limit the Audit Report to certain transaction types. To export to Excel: Click the Export button at the top of the Audit Trail report screen, choose A New Excel Workbook, and then click Export. To export to another program: The Export button also allows you to export the report to a CSV file, which means a comma-separated value format. This type of report is best viewed in a spreadsheet such as Excel. If you don’t have Excel available, choose File, Save As PDF, and then save the report to a PDF file. You should then be able to copy and paste the resulting report into the program of your choice or use the search feature within your PDF viewer – the free Adobe Acrobat Reader is a common choice. Latest means the most recent version of the transaction. Prior means the transaction has been edited. The Audit Trail shows both the latest and previous versions of the transaction. 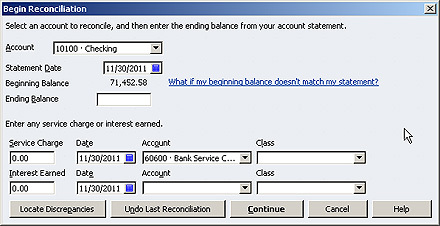 Deleted means that the transaction has been deleted and must be manually reentered in QuickBooks if necessary. 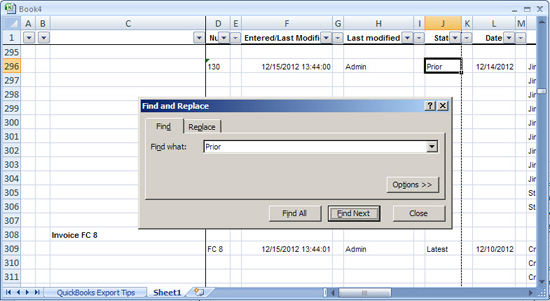 Earlier versions of Excel: Click on cell A1, press Shift-End-Home, and then choose Data, Filter, and then AutoFilter. 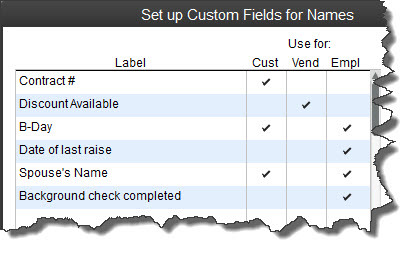 You can then click any of the arrows in row 1 to filter the list to meet specific criteria. 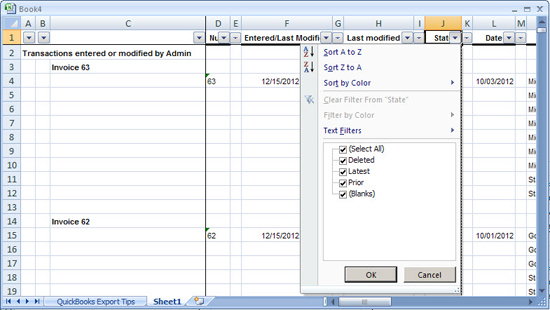 Figure 3: Sending the report to Excel enables you to filter for deleted or modified transactions. Alternatively you can press Ctrl-F and search for the words Prior or Deleted. 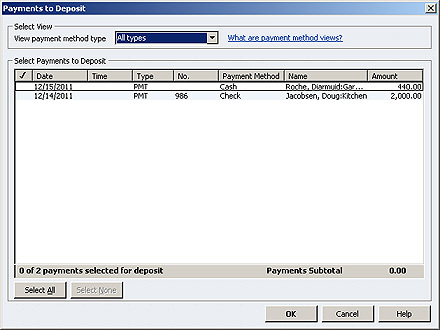 Click the Find Next button to move to the next transaction as you carry out your review, as shown in Figure 4. Figure 4: Excel’s Find feature is another way to sift through a lengthy Audit Trail report. Fraud alert: Perpetrators often generate checks or invoices under one vendor or customer ID, and then modify the accounting records to obfuscate their deed. Always review transactions with a Prior label carefully. Choose Reports, and then Accountant & Taxes. 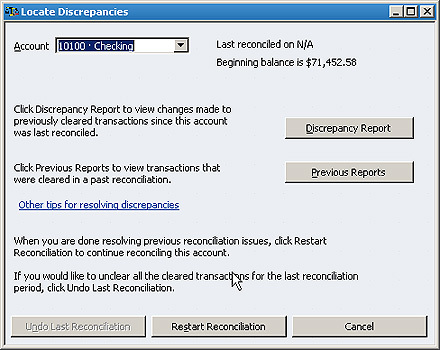 Select either the Voided/Deleted Transactions Summary or Detail reports. Both provide basically the same information, but the Detail report includes the entire transaction, rather than just the top level information shown in Figure 5. 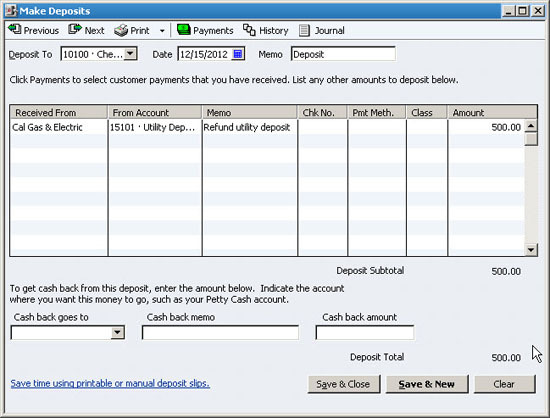 Figure 5: Double-click a transaction on the summary report to view its details. 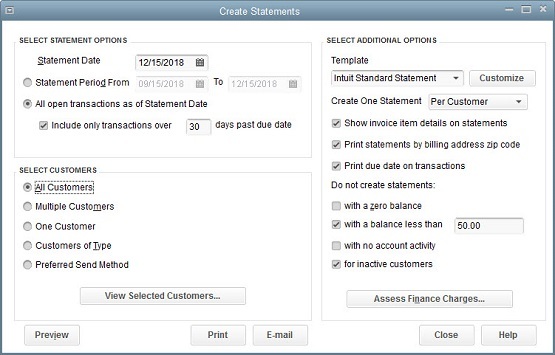 You can use this report to determine if anyone has made changes to transactions subsequent to you specifying a closing date in the QuickBooks preferences. To do so, choose Edit, and then Preferences. Next, choose Accounting, and then Company Preferences. Finally, click the Set Date/Password button, and then follow the onscreen prompts. 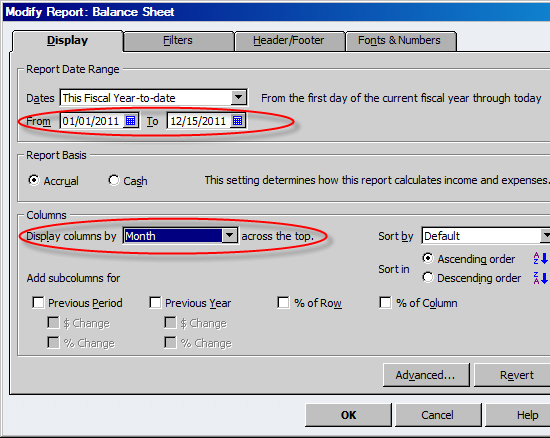 Going forward you can choose Reports, Accountant & Taxes, and then Closing Date Exception Report to monitor any chances to closed periods in QuickBooks. Figure 6: The Customer Credit Card Audit Log tracks all activity related to customer credit cards. To enable logging of customer credit card activity in QuickBooks, choose Company and then Customer Credit Card Protection. Follow the onscreen prompts once you click the Enable button. Also, fraud is often perpetrated by a family member, long time employee, or friend that’s been given too much freedom with too few controls. However, you must not be naïve when it comes to your business. Fraud is very much a reality that can happen in your business. In this article we’ll discuss how fraud happens, how to identify if fraud is happening, and what to do if you discover fraud has happened. We’ll also discuss some measures that you can take within QuickBooks to limit your exposure. Opportunity: Companies often unknowingly present opportunities for fraud. In particular, small businesses are more prone to these because it’s harder to separate duties when you have a small staff. Pressure: Personal pressures can put people over the edge and cause irrational thinking. Someone you know may be under duress due to medical and/or financial issues, or any of a number of other personal situations that influence their judgment. Rationalization: The perpetrator believes they can rationalize their behavior, i.e. they need the money more then the company, the company won’t ever notice, or other insidious thoughts. Indeed, fraud often starts as a “loan”, with the perpetrator fully intending to “pay it back”. Fraudsters will go to extreme measures to cover their tracks. Many small business owners believe it could never happen to them, as their employees are like family. However, it is critical that you separate your thoughts with regard to what happens at work versus what happens outside the four walls of your business. No business is 100% safe. What are five popular types of fraud? Claiming additional payroll hours or falsifying an employee. Giving unauthorized discounts to friends and family. Selling private business information to outsiders. Payroll: Hand-deliver the paychecks, and use this as an opportunity to thank your employees for their work. This will help identify any “false” employees, as well as foster good will among your team. Further, a process for tracking hours will help to minimize extra hours appearing on anyone’s time card. You might have a manager sign off on subordinate’s time sheets, or install a modern time clock that uses swipe cards or biometric identification. Theft of cash or merchandise: Separate duties to the extent possible. Ideally those who receive money should be different than those who that generate invoices. Choose Reports, Sales, and then Sales By Item Detail. Click the Modify Report button, and then click the Filters tab. As shown in Figure 1, choose Items from the Choose Filter List. Select Multiple Items from the Item list, and then choose all discount and bad debt items. Click OK twice to view your report. 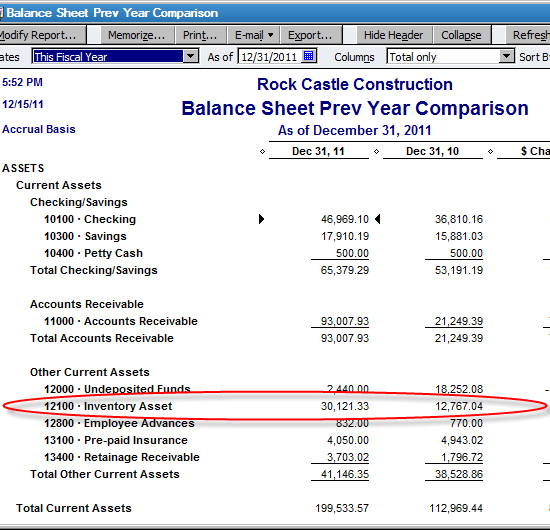 If you find this report helpful, click the Memorize button and assign a benign name, such as Accounting Review. Figure 2 demonstrates another filtering technique for the Sales by Item report. 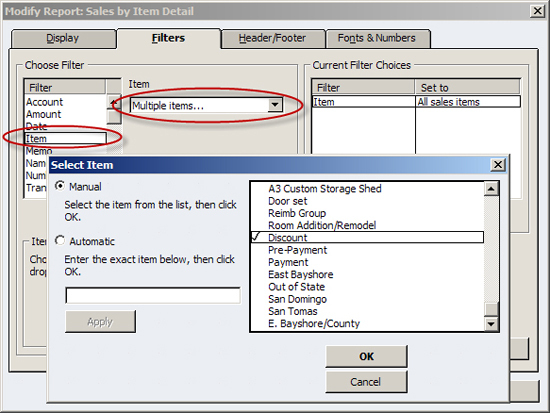 Clear the Item filter, and specify Amount, and then >=0. 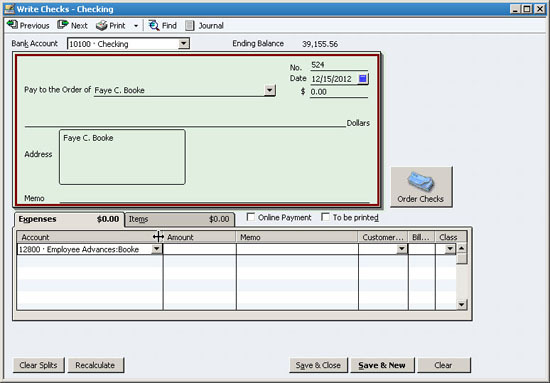 This will display any negative or zero amounts listed on a customer invoice, as well as credit memo items. It may seem counterintuitive to look for amounts that are greater than or equal to zero, but in accounting jargon, invoice amounts should always be credits to an account, which means they’ll be less than zero. Negative items or discounts on an invoice post to your books post as debits, or positive amounts, which will be greater than zero. 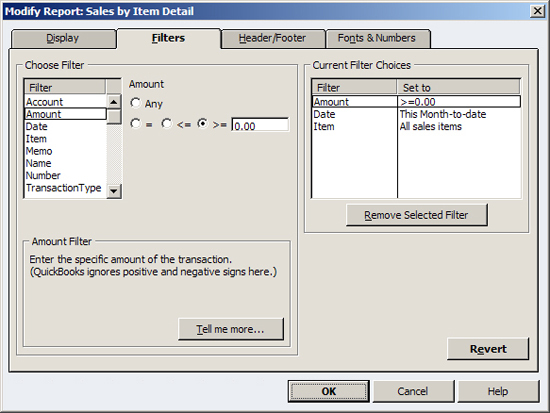 Figure 1: You can filter the Sales by Item report to track discounts and other write-offs. Figure 2: It’s also helpful to search for amounts that are equal to or greater than zero. Selling private information: This is particularly difficult to guard against. One level of defense to require employees to sign confidentiality agreements at the time of hire that discuss what the company considers confidential and the consequences of violating said agreement. Computer systems and paper work should also be protected with passwords, lock and key and whatever other measures may be warranted to minimize unnecessary access. In QuickBooks, choose Company, Users, and then Set Up Users and Roles to assign unique log in names and passwords. 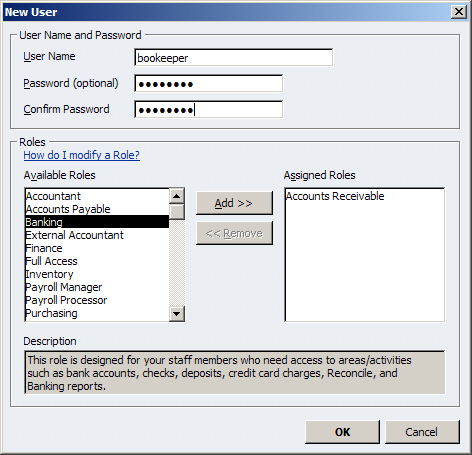 As shown in Figure 3, QuickBooks offers predefined roles that automatically limit access to specified areas, but you can easily tweak a user’s role to meet their exact needs. You should also require users to change their passwords periodically, and whenever possible, have your IT specialist restrict access to the folder where your QuickBooks data resides. However, do be aware that anyone can purchase a password recovery tool for $45 from www.lostpassword.com. 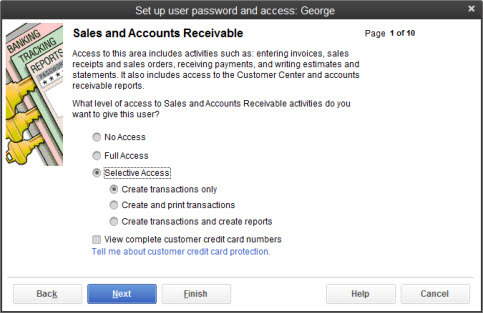 Figure 3: Use passwords in QuickBooks to limit employee access on a need-to-know basis. Expense Reports: Always require receipts on all reports for reimbursement with no exceptions. You should also establish guidelines so that employees know when to seek approval so that they avoid the risk of unreimbursed expenses. Unfortunately there’s no magic cloak that you can place over your business to protect it from fraud. Your best defense is to limit opportunities and remain vigilant. Fraud perpetrators have seemingly limitless imagination, so be sure that you’re always keeping a hand on the tiller of your business. Some institutions allow you to synchronize your records with your online statement. This involves a matching process that automatically clears transactions that match, and makes it easy to quickly post new transactions. 4. Collections Report: Tricky economic times mean it is more important than ever to keep track of your collections. 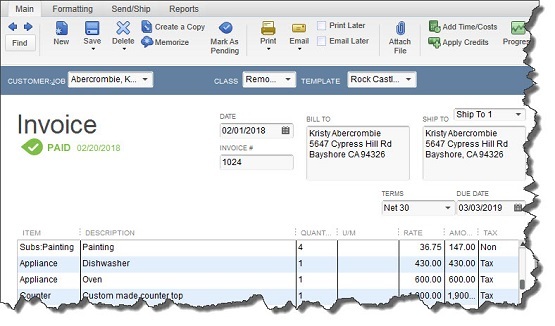 Fortunately QuickBooks makes it easy to contact customers with overdue invoices: choose Reports, Customers & Receivables, and then Collections Report. As shown in Figure 2, the report provides a phone list and shows all overdue invoices. However, you can also use this report to quickly e-mail copies of overdue invoices to your customers. 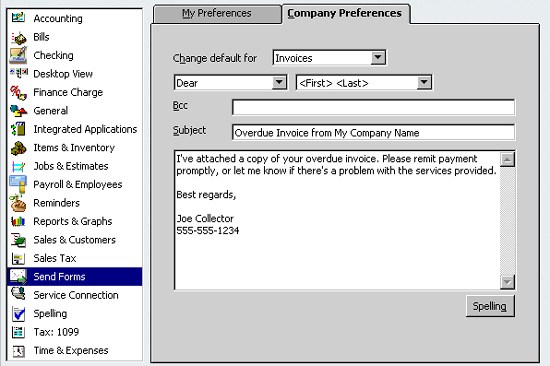 To do so, double-click on a transaction within the Collections report to view the invoice, and then click the Send button at the top of the invoice form to display the Send Invoice form shown in Figure 3. You can modify the wording shown to be more direct, such as a subject line of “Overdue Invoice” or perhaps e-mail text along the lines of “I’ve attached a copy of your overdue invoice. If there’s a problem with our products or services, please let me know immediately, otherwise I trust that you’ll remit payment promptly.” To change the default e-mail text, choose Edit, Preferences, and then choose Send Forms. 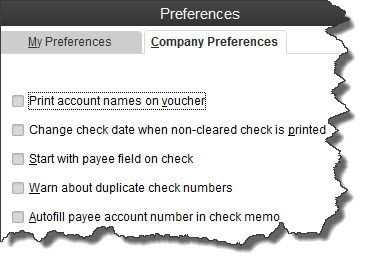 Select Invoice from the Change Default For list, make your changes, and then click OK.
7. Voided/Deleted Transactions Summary: It’s no surprise that small businesses are much more prone to fraud than large businesses. Small business employees usually wear multiple hats, so it’s often impossible to separate financial duties (bigger businesses can do this with ease). Fortunately QuickBooks makes it hard for perpetrators to cover their tracks: choose Reports, Accountant & Taxes, and then Voided/Deleted Transactions Summary. 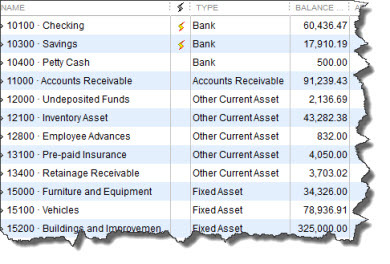 As shown in Figure 5, you’ll be able quickly identify any transactions that have been deleted from QuickBooks. Granted, this isn’t an end-all solution by any means, but it is a helpful management tool. 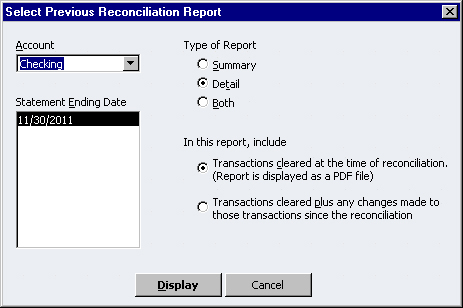 Plus, if a transaction ends up “vanishing” from QuickBooks, you can use this report to see who deleted it! 10. Transaction History: Think of this as a “report within a report”, as you can only run it in certain circumstances. 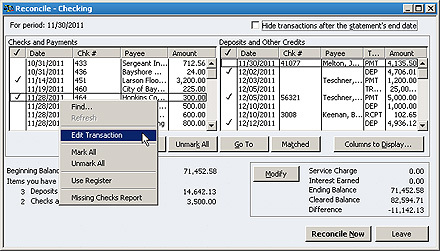 As shown in Figure 6, you must have a transaction open on the screen or single-click on a transaction within a report. You can then choose Reports, and then Transaction History. 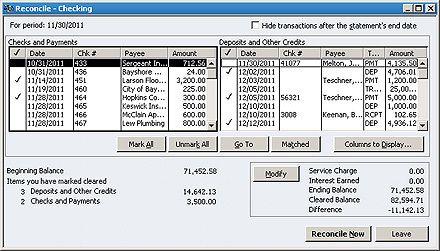 As shown in Figure 8, QuickBooks will display a report that shows the entire history for a given transaction. 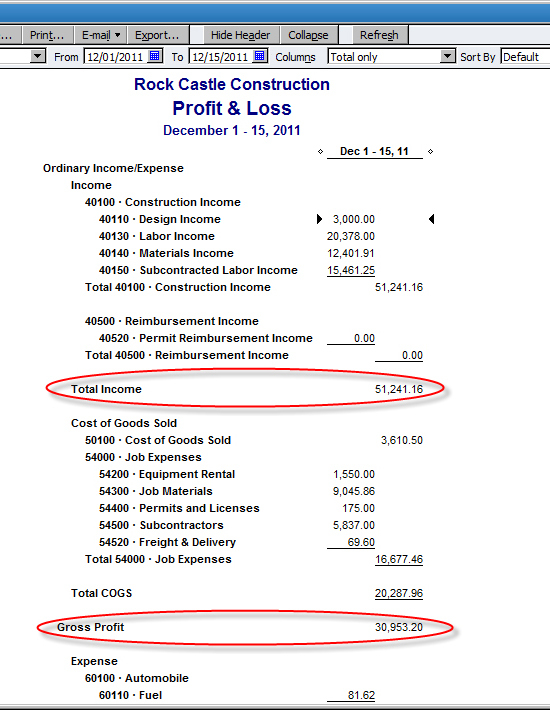 In this case, $30,953.20/$51,241.16 shows a gross profit margin of 60.4%. Is that good? Is it bad? Very often the answer is “it depends”, which is why you should try to compare yourself to similar companies in your industry. Profit margin is another commonly used ratio that you can derive from the Profit & Loss Standard report by dividing Net Income by Total Income. In essence, this is the percentage of sales that the owner of a business gets to keep-before Uncle Sam gets his share. Profit margins vary widely by industry. As you’ve seen, cost of goods sold appears on the Profit and Loss Standard report-look for Total COGS-but you’ll have to perform a quick calculation to determine average inventory. To do so, divide the sum of your beginning inventory plus ending inventory by 2. Your line of business may be included in their free offerings, but even more information is available on a subscription basis. You can find even more resources by searching the Internet search for the term “industry benchmarks”. 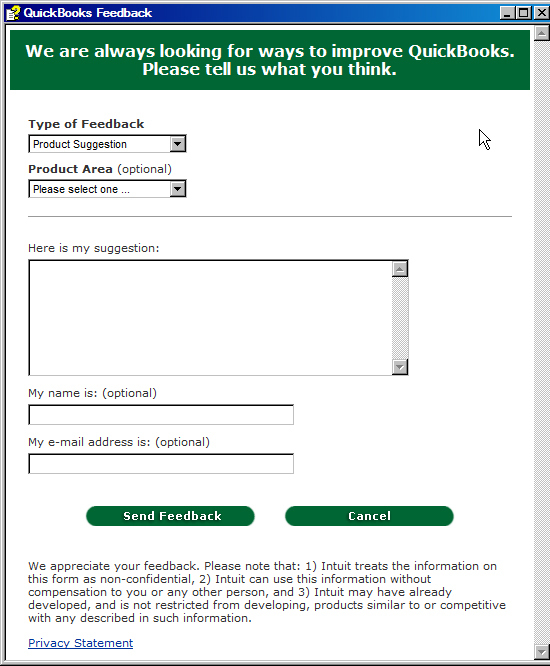 Any of these links will display an online from in your web browser so that you can submit your thoughts directly to the QuickBooks development team. QuickBooks frequently updates its products, so before you send a bug report, choose Help, and then Update QuickBooks. Click the Update Now button to ensure that you have the latest patches and fixes for your version of QuickBooks. Verify that the information at the top of the screen is correct (Payroll Schedule, Bank Account, etc.). 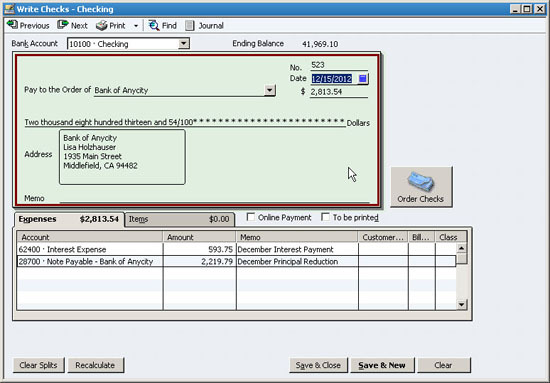 Figure 2: The Preview Paycheck screen shows the numbers behind the check amount. If you’re satisfied that everything is correct, click Continue. 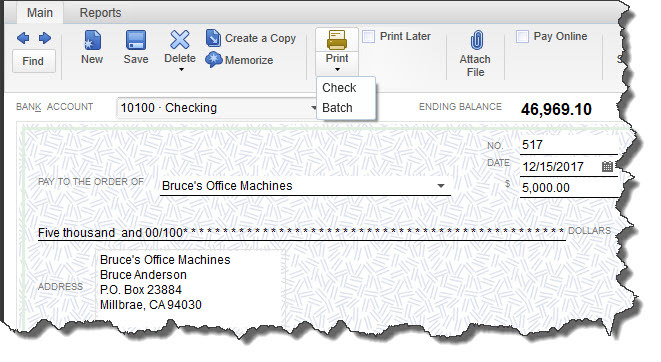 In the next screen, you’ll verify Payroll Information again and check a box to indicate whether checks will be printed or handwritten (you can assign a starting check number to the latter). 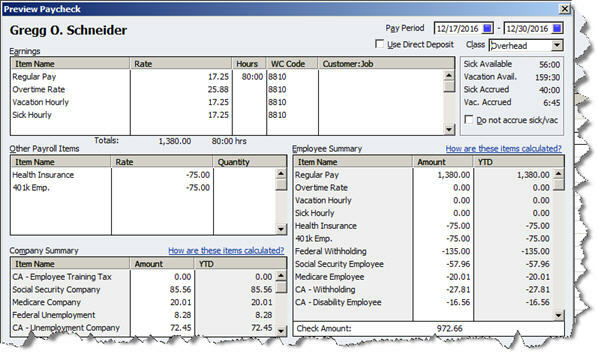 QuickBooks displays a grid containing each employee’s total gross pay, total taxes and deductions, net pay, employer taxes, contributions and total hours. The Direct Deposit field will be checked if the individual is signed up. 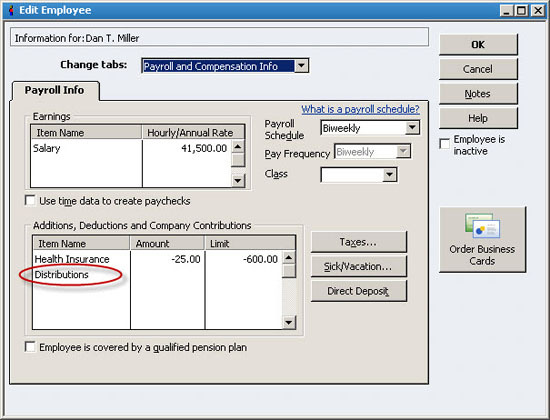 If you’re not sure that your payroll information is correct, you can click Finish Later, otherwise, select Create Paychecks. Whether your accounting tasks are done on a single PC or you have multiple users working on different screens, it’s critical that you make use of all that QuickBooks offers in terms of internal controls. Check registers. Use the Balance Sheet for this. Go to Reports | Company & Financial | Balance Sheet Standard and customize the report for the correct period and, if necessary, for specific customers, vendors and/or jobs. It goes without saying that you should password-protect your QuickBooks company file and change the password regularly, even–and especially–if you are the entire accounting department. It’s important to protect yourself from external fraud too. We can do a review of your security procedures and make suggestions. Know who your employees are (consider running background checks) and, if you can, rotate the duties assigned to accounting staff. If you have only one person managing all of your bookkeeping work, conduct an even more thorough background search: credit, references, and criminal activity. So to minimize frustration, save time and money, and ensure that everything will be accurate when your checks are processed at the bank, it’s important that you use the tools that QuickBooks offers appropriately. 3. You can customize the appearance of your checks. 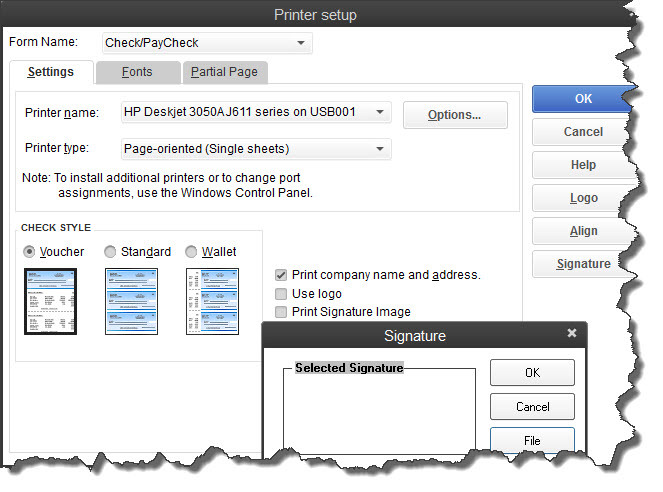 Click File | Printer Setup | Check/PayCheck. Specify printer options and check style, change the fonts in some fields, designate a partial page printing style (using the envelope feed) and add your company’s name and address, logo and a signature image. Check-printing can be tricky, but it must absolutely follow the rules. Let us know if you get stuck or want some guidance upfront ‘ or if you want to switch to online banking and bill-pay. If your business is not particularly complicated, you might get by without knowing a lot about the principles of bookkeeping. Still, it helps to understand the basics, so let’s take a look at some terms and phrases that are helpful for you to understand. Account. 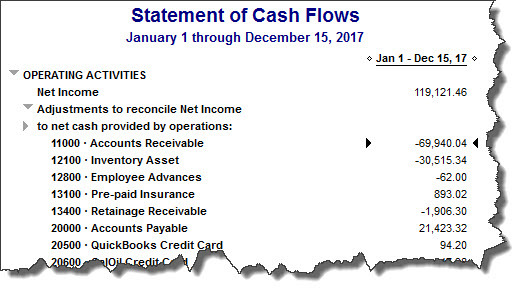 You set up financial accounts like checking and savings in QuickBooks, but in accounting terms, these are referred to as the accounts in your Chart of Accounts: asset, liability, owners’ equity, income and expense. Double-Entry Accounting. 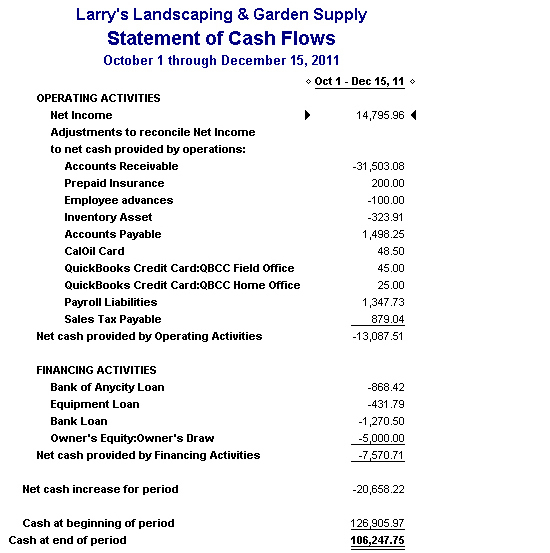 This is the system that QuickBooks uses–that all legitimate small business accounting software uses. Every transaction must show where the funds came from and where they went. Each has a Credit (decreases asset and expense accounts) and Debit (decreases liability and income accounts) which must balance out (other types of accounts can be affected). Equity. This refers to your company’s net worth and is the difference between your assets and liabilities. Sending invoices to your customers to bill for products and/or services is probably one of the more enjoyable parts of your job–second only to recording payments received. And thanks to the company file you’ve built in QuickBooks, creating invoices is generally a very simple process that requires no duplicate data entry. When you’re done, you can Preview your statements, Print, or E-Mailthem by clicking those buttons. How many calendars do you maintain? Many businesspeople have more than one. Maybe you use a web-based or desktop application like Google Calendar or Outlook for meetings, task deadlines, travel dates, etc. Your Customer Relationship Manager (CRM) might have another. Perhaps you still have a paper calendar as back-up. QuickBooks lets you specify exactly when you want to receive reminders of upcoming activities. To set this up, open the Edit menu, click Preferences, and then click Reminders | Company Preferences. Note: If you want QuickBooks to display your reminders every time you launch the software, click on the My Preferences tab and make sure that the box in front of Show Reminders List when opening a Company fileis checked. If it isn’t, click in the box. 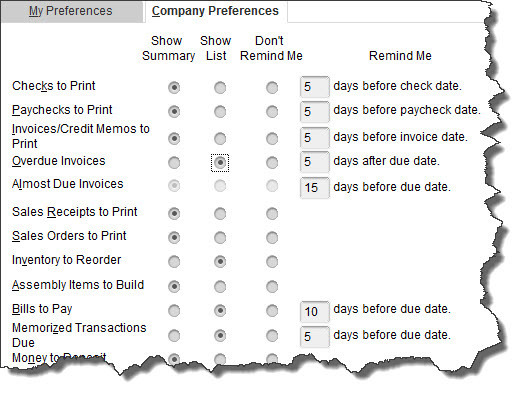 Making modifications in this window is easy; just click in the appropriate circle next to each task to indicate your preference, and change any numbers in the Remind Me column to tell QuickBooks when it should start showing the reminder. Transactions that repeat on a regular basis (bills, invoices, etc.) can be memorized. If the amount is always the same, create the transaction and enter the amount; if not, just leave that field blank. Click Memorize to open the Memorize Transaction window and click on the button in front of Add to my Reminders List. Open the drop-down list to the right of How Often and select the desired frequency. Make sure that the Next Date is correct, and then click OK.